We have donuts on the brain! After setting up our donut themed dramatic play area we are still all about donuts are our house. 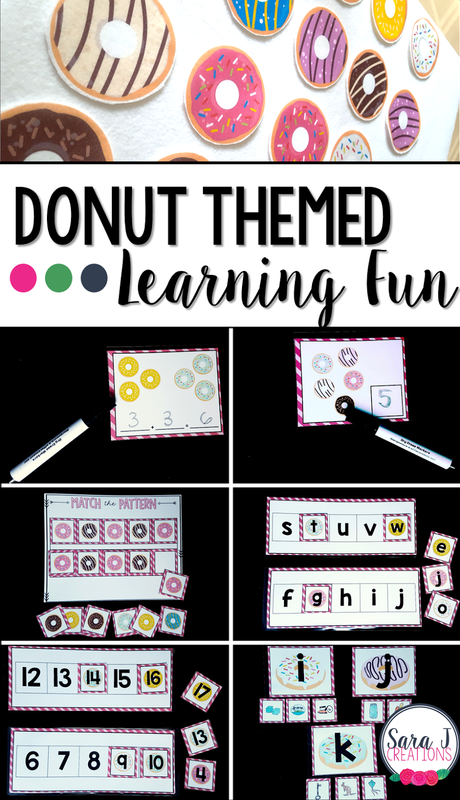 I decided to stick with the donut theme and create some math and literacy activities for K, my 4 year old. I wanted to focus on sequencing letters and numbers, counting, introduction to addition, patterning and beginning sounds. She was so excited to "play" and it led to some good review and some new learning as well. I suggest printing most of the pages in this unit on cardstock and then laminating for durability. You will be able to use these activities again and again. For the letter and number sequencing cards, I folded them in half and then laminated so that they would be two sided and save me some time (and money) when laminating them. Everything else just needs to be printed, laminated and cut apart. For this activity, I wanted K to focus on what letter was missing, what letter comes next, what letter comes before and what letter comes after. We have worked with this a bit but I decided to scaffold it for her. Before we started, I set out all of the alphabet cards and had her line them all up in order so she could use this as a visual reference when we moved to the missing letter part. She wanted to turn on her Kiss Your Brain CD and use the alphabet songs to help her sequence the letters. Too cute! Once we had all the letters set up, I gave her a sequencing card that had a missing letter. I showed her how to use the cards we had lined up to find out what letter was missing. Then we took that letter card and put it on the box. And then, K figured out a way to make it a little easier. Instead of just looking for the card for the letter that was missing, she covered all the letters with the donut cards. I let it go because she was still sequencing the letters and figuring out what was missing. This was a good scaffolded support for her for this new type of activity. We did the same activity only this time we focused on numbers 1-20. Again, we lined up the number donut cards first and then worked on finding the missing numbers. Even though K, was much more comfortable with what comes next with numbers 1-10, she still wanted to cover all the numbers with the corresponding donut card. She still gets stuck on the teen numbers but I liked this activity because it gave her confidence with numbers 1-10 and extra practice on those tricky teen numbers. Next up, we worked on counting donuts and writing the numbers using dry erase markers. I kind of had a mommy fail moment as she struggled to write some of the numbers and realized we've spent so much time writing letters but not much time writing numbers. We need to work on that! When she was frustrated at one point, I told her she could use the donut number cards from the sequencing activity and either set them in the answer box instead of writing it, or use the cards to practice tracing the number so she could try writing it herself. Some numbers she had an easier time writing than others but she did a great job of counting one donut at a time and writing the number the best she could. I wasn't sure if K was quite ready for addition yet. She has shown some basic understanding just when we count and talk about amounts of things. We have never formally written out an addition sentence. When I gave her the cards, she instantly wanted to count the total amount. I showed her how to count one color of donut and then write that number down. Then we counted the next color and wrote that number down. Finally, we counted all of the donuts and wrote down the answer. She did a great job when I made her stop and do each part. I think we need some more work on counting and writing the number before we move on to addition but it was a good introduction activity. My girls are OBSESSED with patterns - or "patt-er-ins" as they call them. Every since we did our fall patterns last year, K has noticed patterns in the world around us. Sometimes she visually sees them. Sometimes she wants to do activities in a pattern like I feed her a spoonful, she feeds herself a spoonful and so on. She loves incorporating patterns and I fully support it. Normally, we just focus on AB patterns because that seems to be the easiest for her to understand and find examples of. We worked on some AB patterning and finishing the pattern that was given. Then, we moved on to some ABC patterns. This made her stop and think a little bit more. We looked at the part of the pattern that we were given and repeated it a few times - chocolate, strawberry, vanilla, chocolate, strawberry, vanilla. Once she figured out that each line wasn't a different pattern (like it had been in our AB patterning activities) and that it was one long line of pattern, she caught on and completed the pattern with no problems. The tricky part was that we had a few different types of chocolate donut cards so she had to pay attention to which one she was grabbing. Our final activity was a beginning sounds sort. We've never done an activity like this before but we have talked about what words start with quite a bit. K is realizing that words are made of letters and she can write those to write words. She will often ask how to spell a word so I thought this might be a good place to start. I didn't want to make the activity overwhelming so I just pulled out three letter cards and only the matching picture cards for those three letters. We talked about each picture and I made a big deal of saying the word with the beginning sound. She instantly knew apple and ball because those are pretty common in ABC books. Once she had a picture for each letter, I would ask her does this word sound more like apple, ball or castle. This seemed to help her and she did a good job matching the pictures to the letter. I don't think she is ready to do the whole alphabet at one time, but I like that this is an activity we can grow into. For now, we will just focus on a few letters at a time, introducing new vocabulary and paying attention to the sound we hear at the beginning. Down the road we can focus on more letters at one time and even have different picture cards that don't fit with any of the letter donuts. If you'd like to try out the math and literacy activities that we focused on, you can download them by clicking the button below. These would make great center or small group activities in a classroom or homeschool setting.